A showcase for cards I enjoy making. Hi all, I have had such fun over the past week, Stuart had a week off work, and we spent a lot of time crafting, and we made lots of cards. 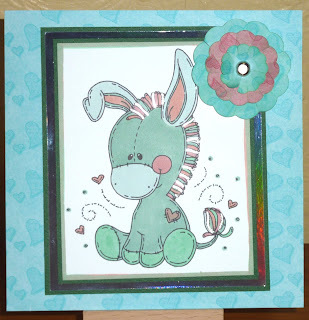 This one was a freebie digi stamp from Meljen Designs, I love Melissa's images,she has beautiful stamps for sale, and gives away some smashing freebies, including this sweet little donkey. Of course I used my Promarker Pens on both images, I am not sure what I did before I found Promarkers, I know I remember being really disappointed with a lot of my colouring, and now I am very rarely disappointed. Both cards are really simple in construction. I used the same papers on both cards, as I am trying to use up some of my older bought papers, I honestly can't remember whose papers these are. I did some searching on the net but as I said they were old 12x12 paper packs, if I find out whose they are I will add it. LOL. 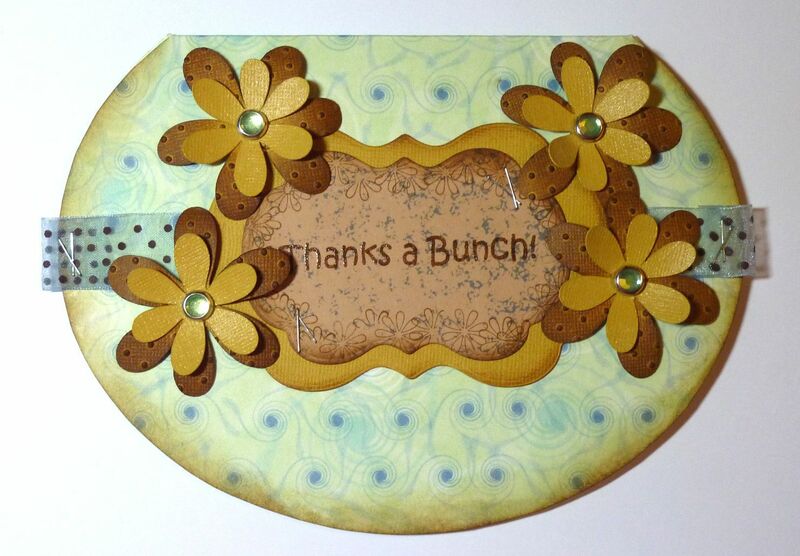 I thought the image was so lovely the cards didn't need to much more embellishment. The card at the top has a flower, cut from Spellbinders Nestabilities - Big Scalloped Circles, the three smaller circles. The bottom card I used a Martha Stewart Doily Lace Edger Punch to make the paper ribbon, and the Nellie's Multi Frame Die Flower to make the embellishment. Both embellishments made using the dies through my Cuttlebug. Hi all, how have you been? As you can see I have been making a few cards recently, and I thought I would show a couple off as I have been rather naughty lately in posting. I am lucky enough to have the latest craft cd by Funky Hand, 'Craft the Year Away', and both the card templates came from that disc, I just popped my base card through my printer, using the new template feature on the disc to make the card shape and then cut it out. Easy Peasy!!! I seem to be in a floral mood at the moment, I don't know if every crafter goes through moods, but I definitely seem to. So both these cards include flowers, the top one, a Thank You card, was made by using my Cricut to cut out the flowers, the cartridge I used was 'Straight From the Nest', which is a lovely set of images. 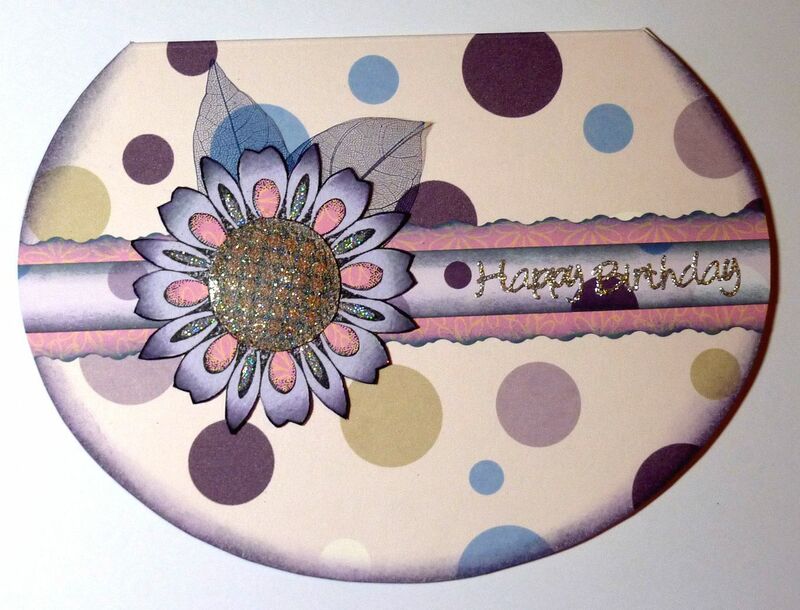 I ran the bottom flowers through the Cuttlebug, using the 'Swiss Dots' Embossing Folder, another of my favourites. The Main image was also cut using a Nestibilities set called 'Labels Fourteen', through my Cuttlebug, decorated with a small flower stamp using Distress Inks, the ribbon was from my ribbon box, and I fixed it with some staples, and used staples on the main image as well. The second card was pretty similar, though the flower is stamped this time, decoupaged up on different papers and glitters and a glorious use of 3D Crystal Lacquer in the flower centre. The stamp was from a set of stamps from Graphicus, which sadly is no longer around, though Glenda Waterworth is, and will be starting a new crafty business soon. I added a couple of skeleton leaves, and then placed a paper ribbon on the card with the flowers as the focal point. 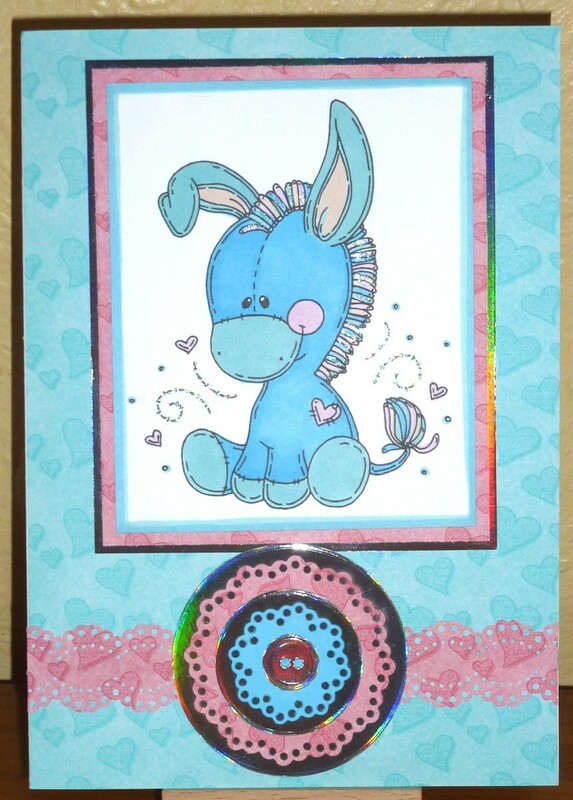 Hi all, I made a new card today, from one of the stamps that came in the last Crafty TSV from QVC. The kit was made by Kanban, and included 10 packs of stamps, an acrylic block, a small black ink pad, a Cd of baking papers and a faux-croc handbag for storing the stamps in, you can take a look at the kit here. I have not bought a QVC TSV for a while now, but loved the look of this one. Though QVC's reliance on Kanban for their TSV's has been annoying to me lately, this one was different and I decided to give the stamps a go. 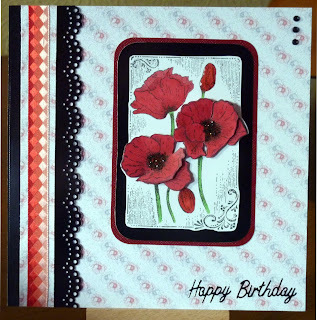 The card I used was a 6 inch square, and the background paper of black and white poppies was from the Kanban background disc, but I used 2 papers in a graphics program, placing one on the top of another and fading the top image down. The side detail is black mirri card, punched using the Martha Stewart, Doily Lace Punch, the link is to the Joanna Sheen store where I bought mine from, but they are sold in loads of places. I also added a strip of the backing paper and then finally placed a harlequin ribbon, from my stash) on the top. The topper was made using the Poppy Stamp sheet, which includes the main image and two smaller poppy images that can be used to decoupage. I coloured in the images with my Promarkers, using Poppy red, Red, and Leaf Green. When it was stuck together, I used Black Stickles in the centre of the Poppies, and for something different, added 3D Crystal Lacquer to the 2 closed poppy flowers. 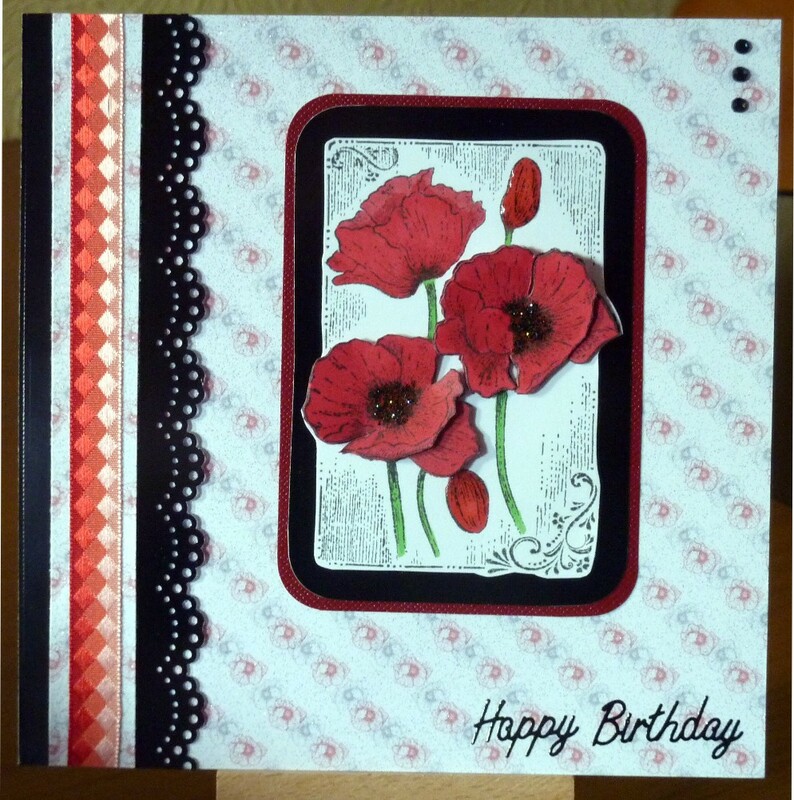 I then placed the finished topper onto mirri black card and red textured paper mats. The topper was then placed onto the card and stuck into position. To finish off the card I added 3 black flat back gems in the top right hand corner, and a black happy birthday peel off. Oh, before I forget I also sprayed the backing paper with Crafter's Companion Iridescent Glitter Spray. Hi all, yes I have made another card, took me a little while but I finally finished it, so decided to show it off. I hope you like it. Firstly I got an A4 sheet of white card from my stash, I am not sure of the gsm, but it is a nice heavy weight card. I ran it through my printer, and printed a lovely blue snowflake backing paper on both sides. The backing paper came from another Funky Hand Craft CD called 'Yule Be Funky', which has some wonderfully different Christmas backing papers to print out. I then measured, so that I could get a card that would fold neatly 3 times and then cut my card down to size. I made the measurements 3.5 inch square for each panel, that's around 8.9 cm square for those who like to be metric... lol. I used am Xcut Corner Punch from Docraft to round the corners of the card and then scored the card using a Hougie Board to score the folds before folding them. I used my Cricut Die Cutting Machine to cut out some silver rounded corner 3 insquares, and then cut out some white squares using the shadow feature to make them slightly bigger. Three of the silver squares went through my Texture Boutique, using a Cuttlebug embossing folder called 'Holly Ribbons'. I then stuck them onto the slightly larger white square, and the placed one in each of the panels on the front of the card. I also placed one silver square un-embossed on the last panel on the back of the card. 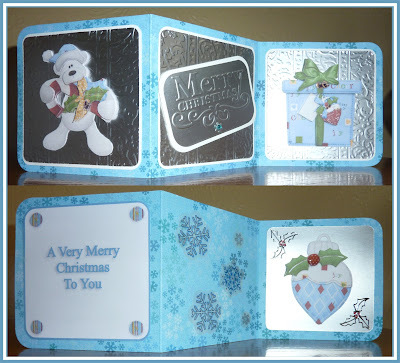 For the embellishments on the card I used a downloaded Scrapbooking kit from Nitwits, called 'The Beary Christmas Collection', I loved the cute little bear characters, and the other parts of the kit. I printed out what I needed onto a single sheet of A4 160gsm text and graphics paper, printing out each image 3 times, so I could decoupage them, and making a 3in square with a Christmas greeting in, and some of the cute buttons from the Bear kit in each corner. After decoupaging each image, I stuck them onto the squares, and then used some 3D Crystal Lacquer to highlight various sections, like noses and bells. 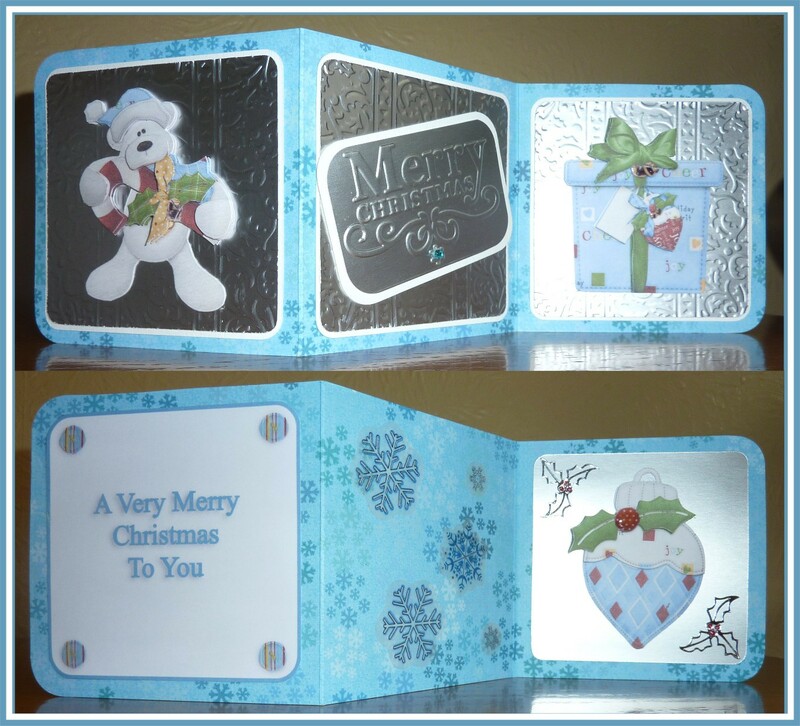 The silver Merry Christmas Greeting was made using the Texture Boutique once more, this time using a Sizzix embossing folder from a set called imaginatively, 'Christmas Set'. I cut it down to size, and layered white card behind it, and placed a blue gem in the middle of the flourish beneath the words. I then put it in the middle panel of the front of the card at a jaunty angle. Front complete!!! The back of the card is not so highly embellished, but is still pretty to look at. I placed the white printed square, with greeting, on the first panel, putting 3D Crystal Lacquer on the buttons to make them stand out. Another decoupage image went on the last panel, with a couple of silver holly peeloffs in opposite corners, with some red Stickles added for the berries. The middle panel has some snowflake stickers I found in my crafty stash, and 'Lo... the card was complete'. 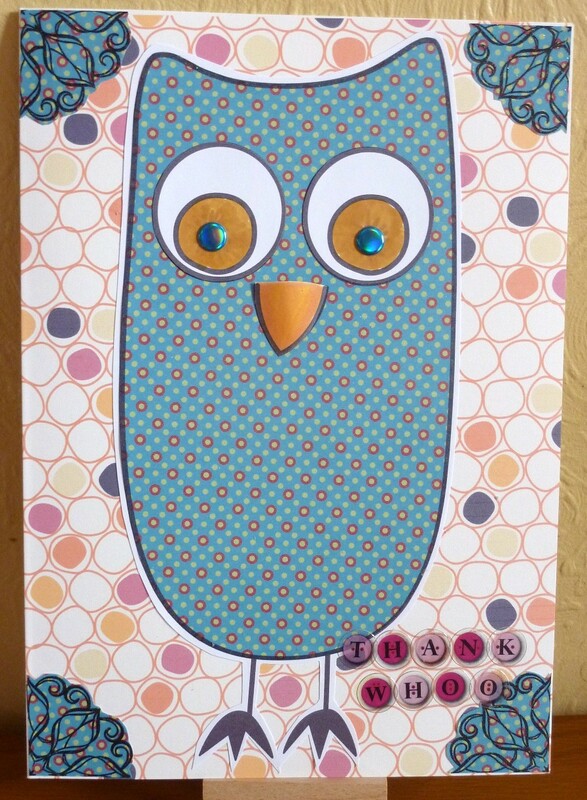 This card is A4 in size, so you can see it is a really big owl !! It was made as a Thank You card for a work chum of Stuarts who brought us some fudge back from her holiday, I thought it was a lovely gesture and wanted to say how much I appreciated it. I love fudge by the way... but then doesn't everyone? 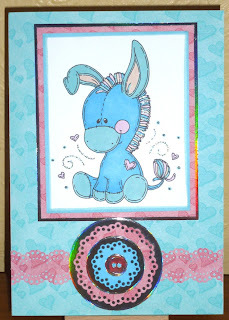 The Digi Stamp image and colourful papers came from a CD-Rom by Funky Hand called, Dreams Come True, part of the Papercraft Factory range. The paper is Rey, Text and Graphic 160gsm, a super clean, bright, smooth and brilliant white almost card paper, that I buy from my local Staples store. The corners are a Mandala stamp cut into quarters, the stamp is called, Waterlily by Glenda Waterworth over at Graphicus. Firstly I decided on an experiment, I chose the background paper from the Dreams Come True Cd and decided to run a full A4 card blank through my printer to see if it would work. My printer takes up to 300gsm card and it worked really well, so I ended up with a funky A4 card to work with. I am not recommending you trying this with your printers of course, it might not be such a happy result if your printer can't take the card weight. I cut out the eyes and the beak from the unpatterned sheet and then cut round the main image leaving a nice border around the edge, makes cutting out the feet easier (sly wink). I then cut the owl out of the patterned sheet, I actually cut off the feet to make it easier, and then used some Crafter's Companion Iridescent Spray and Sparkle Glitter Varnish to give it a lovely sparkle. I then stuck the patterned image onto the unpatterned image. The eyes and beak were coloured with promarkers, and then stuck them on, the beak I raised slightly, the eyes flat, though I have added some blue plastic, foamy round embellishments to the eyes. I then stuck the whole image flat onto the card base. I printed out another sheet of paper with the same pattern I used on the owl and used the Waterlily stamp with a black ink pad. I cut it out and then sprayed it with the Glitter varnish, and then cut it carefully into quarters and stuck a piece into each corner. 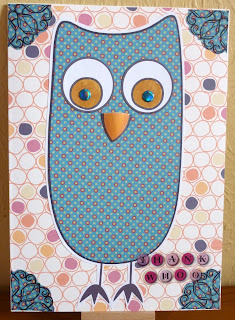 Finally adding a cheerful Thank Whoo, with some alphabet stickers that I found in my crafty stash. I quite liked the finished result, and hope that Val does as well, when Stuart gives it to her at work tomorrow. I am pretty sure she doesn't read this blog, so have no worries of the surprise being ruined. Referrers List - Are you on it? I just wanted to say that I am not affiliated to any of the Craft Shops, Persons or Blogs (except of course GTC's Crafty Corner) that I mention on this Blog... I wish I were lol. All Craft Materials and Tools are my personal likes, and none are sponsored by anyone else. I say what I personally like, and if you know better ways of doing things then please let me know. I would love to hear from you.